What are Hormone Growth Promotants? In a previous note, I mentioned New Zealand Beef and received many questions about Hormone Growth Promotants and messages. Today, I will talk HGPs. First of all, Japanese Ministry of Health, Labour and Welfare declared HGPs cleared a safety standard. 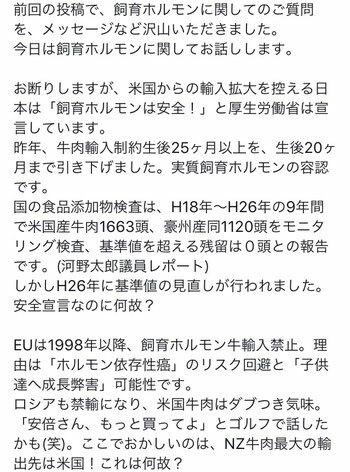 At last year, they brought a standard of 25 months over down to 20 months over, this meant that the Japanese Government approved HGPs substantially. 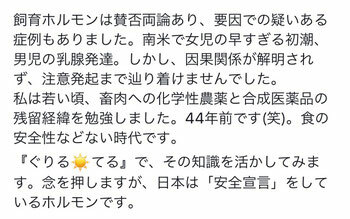 done by a Member of the House of Representatives Taro Kouno's report.) But in the same year 2014, a reassessment for a safety standard figure has been done, on a right hand, declared safety but on the another hand announced reassessment, Why? Since 1998, EU rejects a import of Cattle which used HGPs because of its influence on an inhibition of children growth and the avoidance of risks for a cancer based on HGPs, and in Russia also. 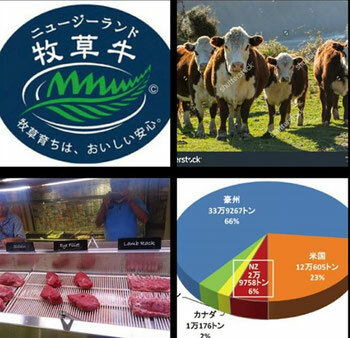 So, U.S.Beef is a surplus stock. " Procure more Beef," it isn't sure whether they could talk or not about this between Trump and Abe on a golf game. 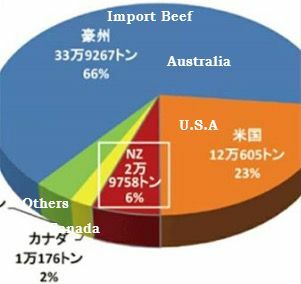 But we have a big question that the country who imported the biggest volume of NZ Beef is U.S. Why? 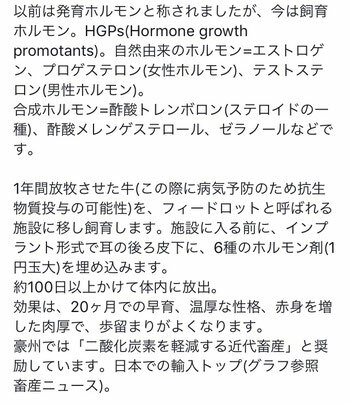 At a previous day, people called it a breeding hormone, but now, we call it the Hormone Growth Promotants as HGPs. Nature Hormones are as Estrogen, Progesterone and Testosterone, while Synthetic Hormones are as Trenbolone acetate (one of Steroids), Melengestrol Acetate and Zeranol. Cattle put to a pasture in about a year will move to a facility called as Feed Lot. (we doubt whether antibiotics have been used to Cattle in it or not for preventing sicknesses,) Before bringing them into this facility, a small sized coin large tablet compounded by six kinds of Hormone will be put into each body with an implantation behind an ear and ingredients will melt down into a body through 100 days. Due to this effect, cattle will grow up within 20 months, keep good tempered and improve a meaty lean meats and a ratio of fabricated meats. There are both opinions as to agree or not. There were some doubtful clinical results due to this cause as in South America continental, too young girl's first menstruation and boy's mammary gland growing but not proved the causal relationship and not declared attentions. About 44 years ago, I learned a remaining process of residual agricultural chemicals and compounded pharmaceuticals which would make influences on livestock meats. In that age there was nothing as an idea to aware a safety of foods. In Japan, the government somehow approved this HGPs as keeping a safety standard.